Y! search blog talks about a new way to access Y! 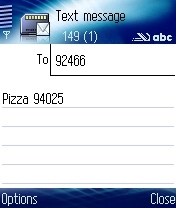 search by SMS. Yeah yeah. But wait, there’s some cool stuff here. 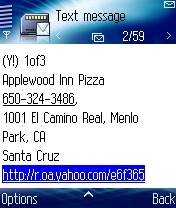 First, no dorking around putting your phone in Internet browser mode, just send an SMS to 92466 (YAHOO). Even better: there are shortcuts (e.g. “d” for dictionary definitions) for when you’re deep in discussion with somebody about the usage of the words “indefinable” vs. “undefinable”. And it’s smart enough to reply with dumb text or rich content (e.g. maps) links, depending on your phone. Frankly just typing “movies 94089” would be enough to meet a common need I seem to have. I pay 10c for sending an SMS message, but $1 or something to call 411. And don’t get me started with mobile web – I’m still on a prehistoric cell phone (which people like to point out any time I use it).